MERCATOR - West:morland, Castria, Cestria etc. MERCATOR, G. / HONDIUS, J. 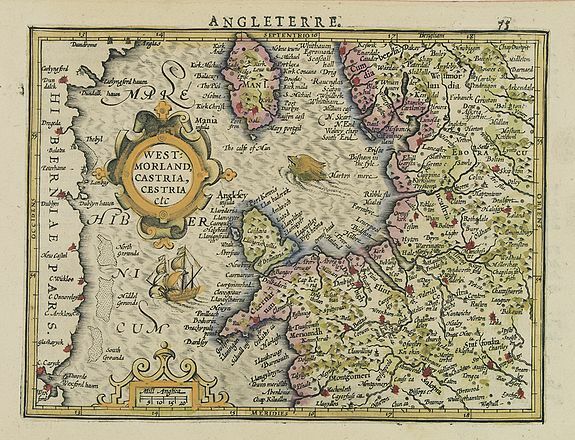 - West:morland, Castria, Cestria etc. West:morland, Castria, Cestria etc. - MERCATOR, G. / HONDIUS, J. Title : West:morland, Castria, Cestria etc.. Size : 5.2 x 7.0 inches. / 13.3 x 17.7 cm. Description :Showing the north-western part of England, including the Island of Man, Liverpool, Blackpool, etc. Condition : Some very light browning of the paper.